DNS records live in the DNS Zone. When you register a domain, this is automatically created for you and, for the most part, you will never need to change your DNS records or zone files. For WordPress.com-registered domains, you can manage your DNS records via your Edit DNS page within your dashboard or from the Domain Manager. A: A records, or address records, link a domain to an IP address. For example, one of the A records on the domain WordPress.com points to 76.74.254.126, the IP address for one of the WordPress.com servers. This lets the browser know that when you type in WordPress.com, in addition to the name servers, the root A record should bring visitors to http://wordpress.com/. CNAME: CNAME, or Canonical Name records, let you point an alias name to another domain or web address. These are different from A records in that you can use a web address — like mygroovyblog.wordpress.com — rather than an IP address, which can change. What’s an alias? Usually, CNAMEs are used to create subdomains, like mygroovyblog.wordpress.com, where mygroovyblog is a subdomain of the wordpress.com domain name. A note about subdomains: on WordPress.com, we automatically drop the www. subdomain from all custom domains. This means that http://www.mygroovysite.com will automatically show as mygroovysite.com in your browser’s address bar. The www. subdomain is an old internet protocol that is no longer necessary. Since we permanently redirect the www. subdomain of your URL, you can still use both versions if you prefer to use the www. on your business cards. MX: MX, or Mail Exchange records, redirect the email to the mail servers for your domain. They guide any incoming and outgoing email messages to the correct servers so that mail sent to you reaches your inbox specifically. TXT: TXT, or Text records, are most often used when verifying a domain through an external service, like Google Apps, by turning an arbitrary string of text into a machine-readable format. We know the DNS records exist, but how do you actually use them? For WordPress.com users, there’s two primary places in which you’ll come across these. We don’t provide email services through WordPress.com, but by using MX records, you can set up a custom email address with your WordPress.com-registered domain through a different email provider. If you’re using the Domain Mapping upgrade with your site and already set up email via your current host or domain registrar, listen up! MX records will come in handy for you as well. Let’s say you’re sending an email to one of your favorite bloggers. Once you hit the Send button, your message is shipped off to an outgoing mail server and moves onto a DNS server, which looks up the MX records for your recipient. At this point, the DNS server acts quite a bit like the post office — in looking up the MX records, it is searching for the correct address to which to send your message to your favorite blogger. With this information in hand, your message is shipped off to an incoming mail server and, voilà, there’s a new email in your recipient’s inbox. When adding MX records to your site, you’ll often receive more than one MX record with a different priority number. The lower the number, the higher the priority. Mail will get routed to the priority server first, and will move onto a lower priority, or backup server, if that fails. For example, smtp.secureserver.net is the priority server in the MX record examples below. MX records sort and make sure your mail gets delivered. Like the post office. Earlier, we mentioned the domain hierarchy, which includes subdomains. A root-level domain is what we generally refer to as a custom domain name, like wordpress.com. A subdomain, on the other hand, is separated by a period as a sub-address off of the root domain, like mygroovyblog.wordpress.com. In this case, mygroovyblog is a subdomain of wordpress.com. This CNAME record would introduce a new alias — blog — and points it to the underlying web address of mygroovyblog.wordpress. This lets browsers know that when you type in blog.example.com, the site can be found at groovydomain.wordpress.com. Q: Do I need to own the root-domain if I want to create a subdomain? A: Yes, in order to create a subdomain, you need to be able to access the DNS records for the root domain, which can only be done through the domain registrar. Any DNS records, from A to CNAME, need to be created through the administrator or owner of the root domain. Without this limitation, we could go crazy setting up subdomains on any address that we wanted. You can manage your DNS records through your Edit DNS page in the Dashboard. Q: I already have email set up through a custom domain I registered somewhere else. Should I not change my name servers to map it to WordPress.com? A: Changing your domain name servers is the supported way for mapping a domain to WordPress.com. If you’re concerned about this change affecting your email, try contacting your email provider before making any changes and asking for the custom DNS records you will need after changing your hosting provider. Once you’ve updated your name servers, you can then add the custom DNS records to your Edit DNS page. Just like name servers can take 24 to 48 hours to fully update, it can take a few hours for custom DNS records to become fully active as well. Once all of your records have updated, your email will continue to go through without a hitch. If you use a subdomain, like mail.wordpress.com, to check your email, keep in mind that you may need to add an additional A or CNAME record to keep that subdomain active. If you don’t already do this, your MX records are all you need. Q: Can I create a custom email address with only a *.wordpress.com URL? A: No, custom email addresses are only available for custom domains. If you own a custom domain and would like to create a custom email address as well, our Add Email support page will give you a run down of options available to you and how to set up each of the listed services. That’s all folks! In just a few weeks, we’ve gone from domain basics to custom DNS records and setting up your own email address with a custom domain. Now, go forth and spread your domain knowledge. 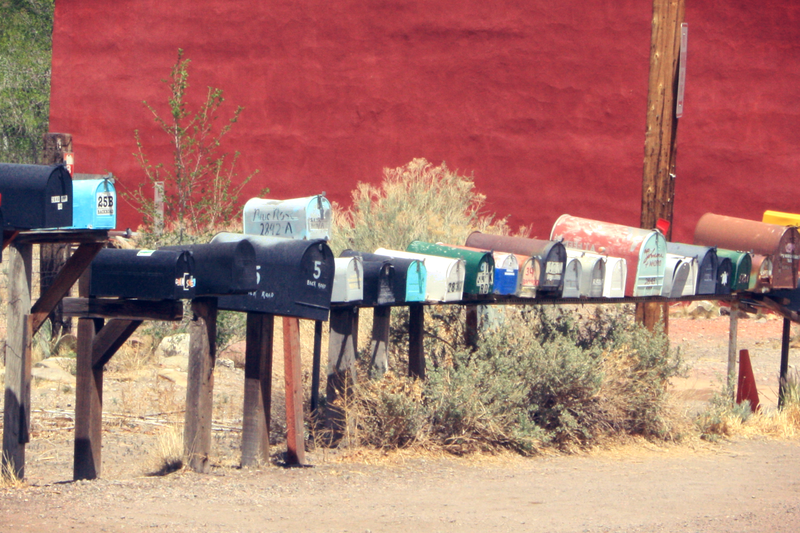 I’ve had this recent desire to photograph mailboxes. I like this one! Super informative! Thanks for posting! Great information; I’m about to change to a custom domain and this answers a lot of questions! Thanks! Thank you for all of the information! Much appreciated. I was advised by my publisher to get domain names, but discovered it to be relatively costly – around $40.00, so decided against it. Why should the registration of a name become a profitable and exploitive enterprise? Registering a domain name through WordPress.com range in price from $18 to $33 per year, depending on the TLD you choose and whether or not the domain is registered privately. Using a custom domain on WordPress.com is optional, and the default WordPress.com address can be used for free for as long as you’d like. Thanks for this series! I’m just starting out so this helps a lot! Great stuff – I’m sparse in the ‘sphere and catching up from below sea level – thanks a million!